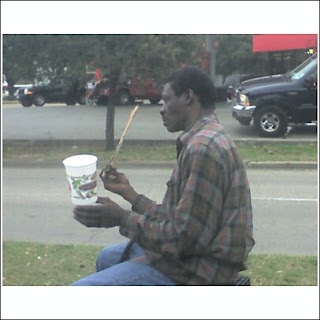 Isiah Factor | The Insite » IF YOU’RE GOING TO BEG FOR MONEY – SHOULDN’T YOU BE STANDING AND AT LEAST TRYING TO HUSTLE? IF YOU’RE GOING TO BEG FOR MONEY – SHOULDN’T YOU BE STANDING AND AT LEAST TRYING TO HUSTLE? February 28, 2007 | Posted in Uncategorized | Comments Off on IF YOU’RE GOING TO BEG FOR MONEY – SHOULDN’T YOU BE STANDING AND AT LEAST TRYING TO HUSTLE? 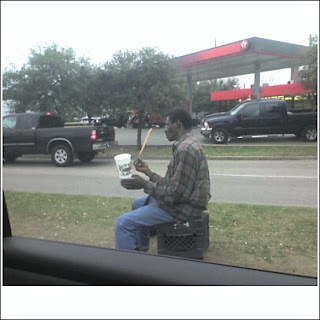 WOULD YOU GIVE THIS SIT DOWN PANHANDLER MONEY? I was in the car at the edge of downtown Houston near midtown Wednesday when I noticed a panhandler. What struck me as odd was the homeless guy was sitting down the whole time on a milk crate at the intersection. He never once got up and walked to the cars to ask for money. He just held out his cups and a cardboard sign in hopes that we would lean out our windows and give him money. I figured if I were a homeless person and looking for spare change, I would get up and hustle. I guess this guy has more experience than I do and a better plan to get money from drivers. Would you give him money if he didn’t at least try to hustle?